In these 26 theses presented at the Milan Meeting of the International Communist Party in 1952, Amadeo Bordiga sets forth his conception of the “invariance” of Marxism, utilizing colorful examples from the histories of religion, mythology, ideology and science as well as the class struggle, denouncing “modernizers” (he says they are worse than Stalinists) “weasel assumptions”, “foolish clichés”, “bourgeois prejudices”, “aberrations”, and “nonsense”, and everything that stands opposed to the “common doctrine of the party, uniform, monolithic, and invariable, to which we are all subordinated and bound, putting an end to all chattering and know-it-all discussions”. The term “Marxism” is not used in the sense of a doctrine that was discovered and introduced by an individual named Karl Marx, but to refer to the doctrine that emerges with the modern industrial proletariat and which “accompanies” the latter throughout the entire course of a social revolution; and we continue to use the term “Marxism” despite the vast field of speculation and exploitation to which it has been subjected by a series of anti-revolutionary movements. Marxism, in its sole valid definition, has three main groups of adversaries today. The first group: the bourgeoisie who proclaim the capitalist commodity type of economy to be permanent and its historical abolition and replacement by the socialist mode of production to be illusory, and consistently reject in its entirety the doctrine of economic determinism and the class struggle. The second group: the so-called Stalinist communists, who declare that they accept the Marxist doctrine of history and economics, but who advocate and defend, even in the highly developed capitalist countries, non-revolutionary demands, which are identical to, when not worse than, the politics (democracy) and economics (popular progressivism) of the traditional reformists. The third group: the self-declared advocates of the revolutionary doctrine and method who, nonetheless, attribute its current abandonment by the majority of the proletariat to defects and initial gaps in the theory that must therefore be rectified and brought up to date. Deniers—falsifiers—modernizers. We fight against all three, and we consider the third group to be the worst of the lot. The history of the Marxist left, that of radical Marxism, or more correctly, that of Marxism, consists in the successive defensive campaigns waged against every “wave” of revisionism that has attacked the various aspects of its doctrine and method, from the very commencement of its organic and monolithic formation that may be dated to the “Manifesto” of 1848. In other texts we have recorded the history of these struggles in the three historic Internationals against utopians, workerists, libertarians, reformist and gradualist social democrats, left wing syndicalists and right wing trade unionists, social patriots, and now the national or people’s communists. This struggle has affected the lives of four generations and throughout its various stages it is not to be identified with a series of names of individual persons, but with a well-defined and compact school and, in the historical sense, with a well-defined party. This long, hard struggle would have lost its connection with the future resumption of the revolution if, instead of drawing the lesson of “invariance” from this struggle, it were to have accepted the banal idea that Marxism is a theory “undergoing a process of continuous historical elaboration” that changes with the changing course of events and the lessons subsequently learned. This is invariably the justification offered for all the betrayals that have accumulated since its inception, and it explains all the revolutionary defeats as well. The materialist denial that a theoretical “system” that had arisen at a particular moment in time (and, worse yet, one that had arisen in the mind and took shape in the works of a particular man, a thinker or historical leader, or both at the same time) could irrevocably apply to the whole course of the historical future, its rules and its principles, must not be understood in the sense that there are no stable systems of principles that are applicable to very long stretches of historical time. To the contrary, a system’s stability and its powers of resistance against being mutilated and even against being “improved”, constitute a primordial element of the power of the “social class” to which that system pertains and whose historical mission and interests it reflects. The succession of such systems and bodies of doctrine and praxis is not connected with the advent of men who define the stages, but with the succession of “modes of production”, that is, of the varieties of the material organization of life of human collectivities. Despite the fact that it obviously recognized the formal contents of the bodies of doctrine of all the major historical eras to be erroneous, dialectical materialism does not thereby deny that they were necessary in their time, and much less does it imagine that their errors could have been avoided if sages or legislators had better ideas, and that this would have enabled them to notice their mistakes and rectify them. Every system possesses its explanation and its reason for existence in its cycle, and the most significant ones are those that have maintained themselves unaltered and retained their organic form over the course of very long struggles. According to Marxism, there is no such thing as continuous and gradual progress in history (especially) with regard to the organization of productive resources, but rather a series of long leaps forward that profoundly revolutionize the entire economic and social apparatus. These leaps are true cataclysms, catastrophes, rapidly unfolding crises in which everything changes in a brief span of time, after it had remained unchanged for a very long period; these crises are like those of the physical world, the stars of the cosmos, geology and the phylogenesis of living organisms. As the class ideology of a superstructure of the modes of production, it is not formed by the gradual daily accretion of grains of knowledge, either; it appears amidst the upheaval of a violent clash and guides the class that it represents, in a substantially monolithic and stable form, over a long series of struggles and conflicts, until the next critical stage is reached, until the next historical revolution. It was precisely the doctrines of capitalism that, while justifying the social revolutions of the past up to and including the bourgeois revolution, nonetheless proclaimed that, from now on, history would advance along a gradually ascending path, without any more social catastrophes, because the ideological systems, gradually evolving, would absorb the flow of the new conquests of pure and applied knowledge. Marxism demonstrated the fallacy of such a vision of the future. Marxism itself cannot be a doctrine that is moulded and reformed every day with new contributions and with the replacement of its parts (or more correctly speaking, patched together with duck tape and bubble gum!) because, despite the fact that it is the most recent example, it is still one of the doctrines that constitute a weapon of an exploited and ruled class that must revolutionize social relations, and which, by doing so, is in a thousand ways the target of the conservative influences of the traditional forms and ideologies of the enemy classes. Although it is possible today—or, rather, it has been possible ever since the day when the proletariat appeared on the historical stage—to discern the outlines of the history of the future society without classes and therefore one without revolutions, it must be affirmed that, during the very long period that will elapse before this future condition is attained, the revolutionary class will be capable of fulfilling its mission only if it acts throughout the entire course of this tremendous struggle by availing itself of a doctrine and a method that remain stable. And this doctrine and method will be stabilized in a monolithic program, regardless of the drastic fluctuations in the number of its supporters and the outcomes of the social stages and conflicts. Consequently, despite the fact that the ideological legacy of the revolutionary working class, unlike that of the classes that preceded it, does not assume the form of revelation, myth or idealism, but of “positive” science, it nonetheless needs a stable formulation of its principles, and even of its rules for action, that performs the role and possesses the efficacy that dogmas, catechisms, tablets of law, constitutions and guide-books such as the Vedas, the Talmud, the Bible, the Koran or the Universal Declaration of Human Rights once performed and possessed. The profound errors with regard to form and substance in those compilations did not deprive them of their enormous organizational and social power (at first a revolutionary power, then a counterrevolutionary power, in dialectical succession); what is more, in many cases these “deviations” contributed precisely to the creation of this power. Precisely due to the fact that Marxism denies any meaning to the search for the “absolute truth” and does not see doctrine as a manifestation of the eternal spirit and abstract reason, but rather as an “instrument” of labor and a “weapon” for combat, it postulates that, at the most trying moment during the fiercest stage of the battle, one does not abandon, in order to “repair them”, either one’s tools or one’s weapons, but that one conquers in times of peace as well as in war by keeping a firm grasp from the very beginning on good tools and good weapons. A new doctrine cannot appear at just any historical moment, but there are certain quite characteristic—and even extremely rare—eras in history in which a new doctrine can appear like a blinding flash of light; if one has not recognized the crucial moment and fixed one’s gaze on this terrible light, in vain would one have resort to the candle stubs with which the academic pedant or the combatant of little faith attempts to illuminate the way forward. For the modern proletarian class that took shape in the first countries that underwent major industrial capitalist development, the dark clouds parted shortly before the halfway point of the 19th century. The integral doctrine in which we believe, in which we must, and want, to believe, then had all the information it needed to take shape and to delineate the outline of a centuries-long process (during which it would have to be confirmed and driven home after immense struggles). Either this position would prove to be valid, or else the doctrine would be convicted of falsehood; but then the declaration of the appearance of a new class with its own character, program and revolutionary function in history would have been an empty assertion. As a result, anyone who attempts to replace essential parts, theses or articles of the Marxist “corpus” that we have possessed for approximately one century destroys its power in a worse way than someone who completely renounces it and proclaims its miscarriage. The “explosive” period, in which the very novelty of the new positions causes them to be clearly perceived and establishes clear-cut boundaries for them, is followed by a period whose outstanding feature was, and still is, its great stability, as a result of the chronic nature of the ensuing circumstances, so that so-called class “consciousness” does not undergo any improvement or reinforcement, but instead an involution and degeneration. All the history of Marxism proves that the movements in which the class struggle is recrudescent are those in which the theory returns with affirmations reminiscent of its origins and its first integral expression: we need only recall the Paris Commune, the Bolshevik revolution and the period after the First World War in the West. The principle of the historical invariance of the doctrines that reflect the missions of the contending classes, and even that of the powerful moments when they return to their original tablets, applies to all the great historical periods. This principle is opposed to the weasel assumption that each generation and each stage of intellectual fashion is more powerful than the preceding one, to the foolish cliché of the continuous and incessant advance of civil progress, and to other similar bourgeois prejudices, from which few of those who label themselves with the adjective, “Marxist”, are really exempt. All myths express this, and especially the myths of the semi-human demigods, or of the wise men who had interviews with the Supreme Being. It is pointless to laugh at such stories; only Marxism has allowed us to discover their real, material substructures. Rama, Moses, Christ, Mohammed, and all the prophets and heroes who ushered in centuries of history for the various peoples, are different expressions of this real fact that corresponds to an enormous leap forward in the “mode of production”. In the pagan myth, wisdom, that is, Minerva, did not emerge from the head of Jupiter due to the dictate of whole volumes of spidery handwriting, but thanks to the hammer-blow of the worker-god Vulcan, who had been called upon to cure an unending headache. 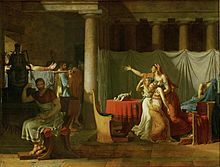 At the other extreme of history, and in opposition to the Enlightenment doctrine of the new Goddess Reason, Gracchus Babeuf would rise up like a giant, with his crude theoretical presentation, in order to say that material, physical force is a greater force for advancement than reason and knowledge. Nor do we lack examples of restorers who confronted revisionist deviations, which was the role played, for example, by Francis of Assisi with respect to Christ when Christianity, which had originally arisen for the social redemption of the humble, made itself at home in the courts of the medieval lords; and also the Gracchi with respect to Brutus1; and so many of the precursors of a class that was yet to come who had to act as restorers with respect to the revolutionaries who had repudiated the heroic phase of the preceding era: the struggles in France in 1831, 1848, 1849 and innumerable other such moments throughout all of Europe. We maintain that all the great events of recent times are just so many categorical and integral confirmations of Marxist theory and its predictions. We are referring above all to developments that have once again provoked large-scale desertions from the class terrain and which have even confused those who judge the Stalinist positions to be completely opportunist. These developments are the advent of centralized and totalitarian capitalist forms (in the economic as well as in the political domains), economic planning, state capitalism, and the openly dictatorial bourgeois regimes; and, on the other hand, the Russian and Asiatic developmental process as seen from the social and political points of view. We therefore see that our doctrine, born in monolithic form, is confirmed at a crucial historical juncture. Anyone can confront Marxist theory with the historical events of this volcanic period and prove that it is erroneous, that it has completely failed, and thus every attempt to deduce the guiding threads of the course of history from economic relations has also proven to be a failure. At the same time, he will also prove that, regardless of the historical period, events compel the establishment of new deductions, explanations and theories, and therefore the acceptance of the possibility of proposing new and different means of action. An illusory solution to the difficulties of the present time is that of admitting that the basic theory must be subject to change and that it is precisely today that the moment has arrived to add some new chapters to that theory, so that, by way of such an act of thought, this unfavorable situation can be reversed. Furthermore, it is an aberration that this task should be assumed by tiny groups with hardly any members and, worse yet, that it can be resolved with a free discussion that constitutes a parody on a Lilliputian scale of bourgeois parliamentarism and the famous clash of individual opinions, which is not a new breakthrough but rather old nonsense. This is a moment of the deepest low point of the curve of revolutionary potential; we are therefore decades away from the right moment when original theories can be born. At this moment, which is without the perspectives associated with a great social upheaval, not only is the political disintegration of the world proletarian class a logical datum of the situation, but it is also logical that there should be small groups that know how to maintain the red thread of history of the great revolutionary process, stretching in a great curve between two social revolutions, on the condition that such groups show that they do not want to disseminate anything original and that they continue to adhere strictly to the traditional formulations of Marxism. Criticism, doubt and challenges to all the old firmly consolidated ideas were vigorous elements of the great modern bourgeois revolution which surged ahead in gigantic waves against the natural sciences, the social order and the political and military powers, in order to advance and emerge later with a much-reduced iconoclastic impulse with regard to the sciences of human society and the course of history. This was precisely the result of an era of profound upheaval that found itself straddling the feudal and agrarian middle ages and modern industrial and capitalist society. Criticism was the effect rather than the motor force of this immense and complex struggle. Doubt and individual control over one’s own consciousness were the expressions of the bourgeois reform against the established tradition and authority of the Christian Church, and took the form of the most hypocritical Puritanism that, under the flag of bourgeois conformity to religious morality or individual rights, promoted and protected the new class rule and the new forms of mass servitude. The proletarian revolution proceeds in the opposite way, in which individual consciousness is nothing and the unitary direction of collective action is everything. When Marx said in his famous “Theses on Feuerbach” that the philosophers had interpreted the world enough and that now we have to transform the world, he was not saying that the transformative will conditions the fact of the transformation, but that first comes the transformation determined by the clash of collective forces, and only later the critical consciousness of this transformation in individual subjects. The latter do not act by virtue of a decision arrived at by each individual, but from influences that precede knowledge and consciousness. The passage from the arms of critique to the critique of arms precisely shifts the entirety of the thinking subject to the militant masses, in such a manner that not only rifles and cannons are weapons, but above all that real instrument that is the common doctrine of the party, uniform, monolithic, and invariable, to which we are all subordinated and bound, putting an end to all chattering and know-it-all discussions. From the Milan Meeting of the International Communist Party, held on September 7, 1952. Spanish translation originally appeared in the journal, El Programa Comunista, No. 33. 1. Bordiga is referring to Lucius Junius Brutus, who led the revolt that expelled the last king of Rome, Lucius Tarquinius Superbus, and then founded the Roman Republic in 509 B.C., according to Roman literary tradition—American translator’s note.